Security forces continuing to search for terrorist who stabbed 29-year-old Rabbi Itamar Ben Gal from Har Bracha. IDF soldiers, Border Police officers and the Israel Security Agency (Shin Bet) are continuing their pursuit of Arab terrorist Abed al-Karim Adel Assi, who carried out Monday's stabbing attack at the entrance to the city of Ariel, in which Rabbi Itamar Ben Gal was murdered. Ben Gal's funeral will be held on Tuesday morning at 10:45 a.m. in his community of Har Bracha. Miriam Ben Gal, the widow of Rabbi Ben Gal, said on Monday night, "This afternoon I lost my husband on the land of Israel, he was murdered because he is Jewish. I am here in my home, in the home that he will not return to. Tomorrow we will bury him here at Har Bracha, in the community he loved and wanted so much to develop." Earlier on Monday, several hours after the stabbing attack, a brit milah ceremony for Miriam's nephew was held in Har Bracha. 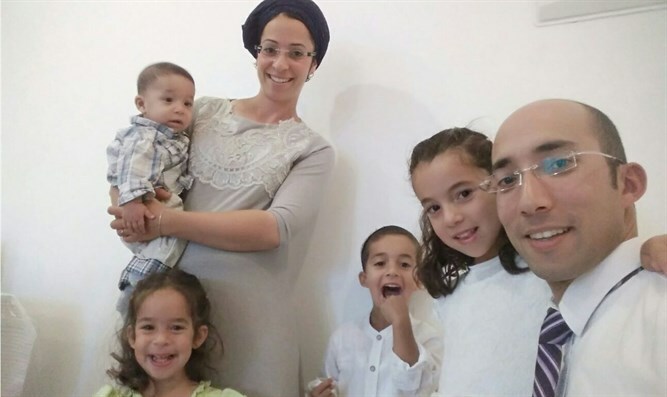 Rabbi Ben Gal, 29, a father of four children, grew up in Rehovot and was a teacher at the Bnei Akiva yeshiva in Givat Shmuel. He knew Rabbi Raziel Shevach, who was murdered a month ago in a shooting attack near Havat Gilad. Investigations into Monday's attack indicate that the terrorist arrived at the bus station, a favorite hitchhiking spot, at the entrance to the city of Ariel, stabbed Ben Gal and began running away. An IDF officer who identified the terrorist pursued him in his car and hit him - but the terrorist managed to enter a vehicle and flee to a nearby village. According to eyewitnesses, the victim shouted "it's an attack, he stabbed me" and fell. Eyewitnesses and video footage show that the terrorist surprised Ben Gal from behind and managed to stab him several times through to the chest. Ben Gal then collapsed on the sidewalk and the terrorist fled. Others said he managed to bang on the door of a passing bus and shout that he had been stabbed. The terrorist is a resident of Jaffa who has a blue Israeli identity card denoting Israeli citizenship. He once lived in the Shanti House for runaway, homeless youth in Jaffa, but the staff found out that he made a habit of visiting the hostile PA city of Shechem and informed him he would not be able to continue living there if he did not cease doing so. As a result, he decided to leave Shanti House.